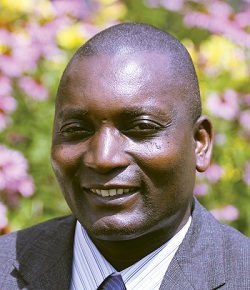 Benjamin David works at the Teacher Training College (TTC) in Blantyre, in the southern region of Malawi. It was here that Benjamin was first trained to be a teacher, graduating eighteen years ago. From there, he went to an elementary school in the middle of the country in Machinga where he worked with young people for twelve years, teaching not just reading, but eight other subjects as well. When I asked him what kinds of things he was learning here that will help him with the situation back home, he was quick to reply, “We need to form a group back at home, a task force that can plan projects and workshops. We should begin in an individual TTC, and go from there.” He indicated that discussions about forming teams like this had come up in the Curriculum and Classroom Dynamics class, and had clearly planted a seed. Strength in numbers, with like-minded colleagues. Teamwork. Always a good thing. Benjamin pointed out to me that there are only ten Malawian teachers here at Lakeland, learning new things. 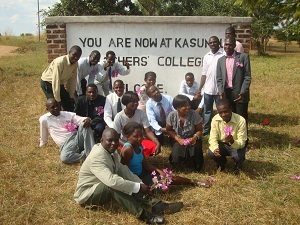 They are just ten among hundreds of teacher trainers and curriculm planners in Malawi. Benjamin sees that part of his job is to discover which of all the things he is learning can be successfully customized to the context of Malawi and to bring that back to his colleagues at home. He stated, "This is not just a mere change, rather it's a change to be directed towards meaningful input to a Malawian learner." Benjamin said that the most strange and surprising thing so far was his journey here: the plane ride. The word he used was “weird,” having never traveled anywhere by plane before. He was also greatly impressed by Bookworm Gardens, the children’s reading garden in Sheboygan. He liked how books are available to visitors right there in nature, in a rich, experiential, visual environment that enhances the story. He especially enjoyed hearing Valerie Elzinga, wife of Professor Jeff Elzinga and a teacher in Valders, tell the story of Jack and the Beanstalk during the visit. Benjamin is excited to be at Lakeland. He looks forward to returning home to his work and his family—a wife, three daughters (ages fifteen, seven and two), and a son, age ten—a year from now with new energy and new tools to teach reading. One key, he said, is “to model for learners how to read.” He feels that this has not happened enough in Malawi. left to right: Overton Simbeye, Phillip Nachonie `06 and Elias Lyson. Yesterday afternoon, as we were preparing a summer lawn party to celebrate the presence of the Malawians at Lakeland, the sky went very dark in the east and we determined we should move the festivities inside. Good thing. By 5:15, we had a deluge on our hands. But thanks to the usual Lakeland teamwork, the party went on undisturbed. 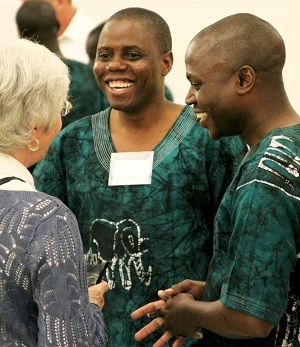 Nearly eighty guests braved the rain and joined us in the Wehr Center to welcome the Malawians. The invitees were members of Lakeland’s two leadership giving groups, the 1862 Society and the Founders Society. It was a time to make new connections and find old friends. (Three of the students graduated from Lakeland once already: Kapera Mlowoka `08, Ndamyo Mwanyongo `08, and Phillip Nachonie `06.) Today’s post begins a series in which I will introduce each student to you and his or her hopes and dreams for education in Malawi. As President Eck put it last night in his remarks to the gathered friends, "...We are all here to make the world a better place. The Malawians have traveled a long, long way. They have left their homes, jobs and families to dedicate themselves to becoming the best teachers they can be. Let us raise a toast to them tonight and in the coming year, let us support them on this journey.” And, let me add, remember to bring an umbrella. When Kapera Mlowoka graduated from Lakeland College in 2008 with a bachelor’s degree in general education, he never would have imagined that one day, he would find himself back here. Kapera explained to me that in Malawi, a person does not necessarily get the job that he or she wants or is best-suited for, but the job that is available. There is a great need for teachers in Malawi and people go into this line of work simply because there are so many openings. 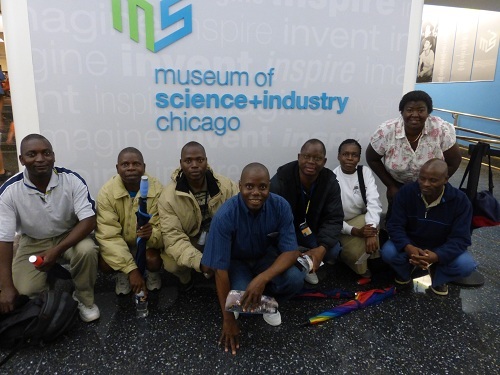 Kapera is from Mzimba in the north of Malawi, and works at the TTC in Kasunga about 120 miles from his birth place. He and his wife and four boys live in special housing at the school. The oldest son is nearly 18 and the youngest is 8. Kapera told me that when he was here the first time getting his undergraduate degree, his youngest child was born while he was away. He did not meet his son until he went home three years later. It was just a little over one month ago that ten teachers left their homes, jobs, and families in the African country of Malawi to make the long trek to Lakeland College. Their purpose? To begin an eighteen-month course of study leading to a Masters of Education degree with a special emphasis on early grade reading instruction. The Malawians will return home a little over a year from now to develop and complete their thesis or action research projects, explain and defend their work before a panel of educators, and then continue their jobs in the Teacher Training Colleges where they are already employed. They will bring with them a wealth of new knowledge and awareness gained during their time in America and at Lakeland. They will be prepared to “teach the teachers,” raising the bar on the methods and best practices of early grade reading instruction for the children of Malawi. The Malawians are here under the auspices of an $880,000 federal grant provided by the United States Agency for International Development (USAID). The grant covers their travel, tuition and other instructional fees, health insurance, monthly stipend and a laptop computer for each person. 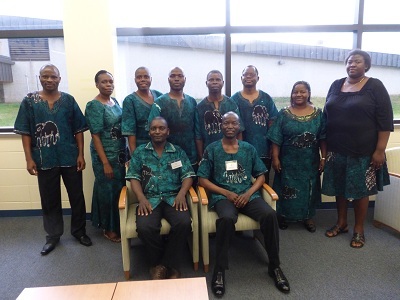 When these ten students return to Malawi in June 2015, ten new students will arrive to begin their M.Ed. degree program. 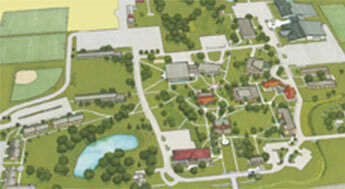 The college is responsible for the costs of room, board, some incidentals, and administrative support. The faculty and administration of Lakeland College recognize that improving the quality of education world-wide begins with building a culture of reading among children and their families. Because of the college’s long-standing relationship with Malawi, we were determined to work directly with the Ministry of Education in Malawi to train reading teachers. Teachers in Malawi teach bilingually, in the native language of Chichewa as well as in English. We are committed to helping them learn how to design and implement curricula and teaching strategies that will cultivate skilled, self-motivated young readers in their home context. We envision these children growing into adults who will lead dynamic and meaningful lives; they will be contributors to a more peaceful, just, and equitable society. The Malawians have already worked as teachers at home for several years, but for the next year, they will be students at Lakeland, and the college welcomes them with open arms. This blog is dedicated to telling you the story of their educational journey. Please welcome them by following us as we go.